Yugpurush - Mahatma Ke Mahatma - Play in Hindi The Father of the Indian Nation, Mahatma Gandhi is synonymous with Ahimsa and Satyagraha. One wonders who the Mahatma's inspiration was. Gandhiji placed Shrimad Rajchandraji as foremost among those he considered to be his guides. Shrimadji's direct interaction with Gandhiji and His letters, both played a pivotal role in shaping Gandhiji's character and kindled in him the novel idea of using Ahimsa to attain independence. 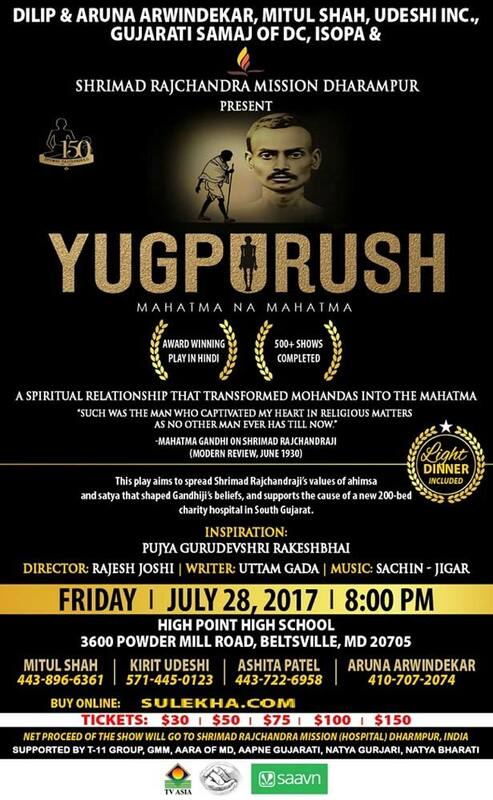 The Yugpurush is a heart-touching portrayal of this special bond between Shrimadji and Gandhiji that catapulted him from 'Mohandas' to 'Mahatma'. What began as friendship, progressed to Gandhiji's proclamation of Shrimadji as his spiritual mentor. Commemorating Shrimadji's 150th Anniversary, this theatrical presentation is a tribute to two great souls and an opportunity for all to be inspired! It is a wonderful drama. In India, more than 500 shows have been played in Hindi, Gujarati and many other reginol languages. It has won many awards and accolades. The following paragraph describes a short synopsis of the drama. 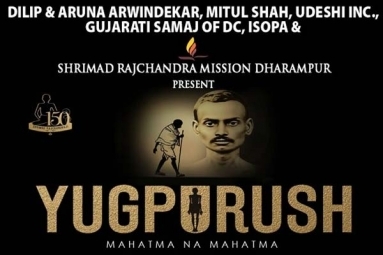 It is a great drama which highlights from where did Gandhiji got his inspiration regarding Ahimsak satyagrah. All the funds from this drama is going towards construction of a new state of the art hospital built by "Love and Care" non-profit organization. The hospital is being build in an under privileged area near Surat. The link below gives complete detail of the hospital.